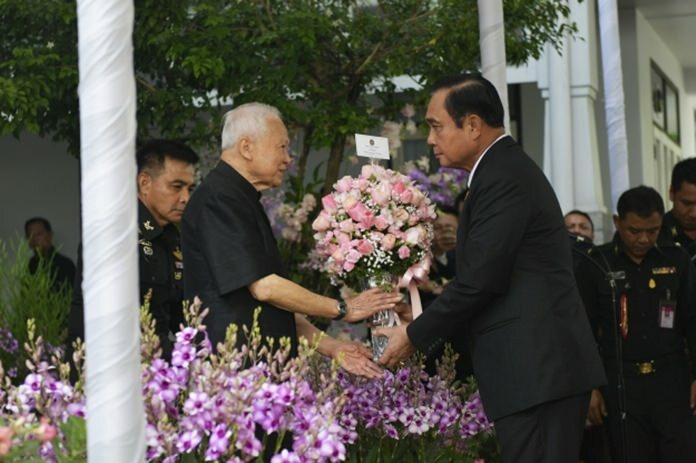 BANGKOK – The Prime Minister vowed to help pull the country out of conflicts as he wished the Privy Council President a happy birthday. Ahead of the 97th birthday anniversary of Privy Council President and Statesman Gen Prem Tinsulanonda on August 26, 2017, Prime Minister Gen Prayut Chan-o-cha led Cabinet members and military commanders in offering their well wishes to Gen Prem at the Si Sao Thewet residence. In his statement, the Prime Minister praised Gen Prem for setting a good example in promoting national development, upholding honesty and doing good deeds for the society. He then encouraged all sectors to jointly promote national unity and pledged the government’s commitment to pushing the country forward under the Pracharat policy. With cooperation from the media, the premier was adamant the country will be liberated from ongoing conflicts and poverty and will eventually emerge as a regional superpower. In response, Gen Prem conveyed his appreciation to all for their hard work, sacrifices and dedication to creating happiness among Thai citizens. He also wished for the Prime Minister’s unwavering determination towards the betterment of the nation as well as success of the entire Cabinet. On this occasion, the Privy Council President presented his well-wishers with a book in memory of His Majesty the late King Bhumibol Adulyadej, authored by Venerable Somdet Phra Phutthakhosachan, as a souvenir.